Bryson DeChambeau has taken out the John Deere Classic in Illinois on Sunday and in the process has earnt a spot in this week’s Open Championship. DeChambeau, a former US Amateur champion, sank a 8 metre birdie putt at the final hole to help clinch his first PGA Tour victory in style as he stormed home with six back-nine birdies to card 65 and finish at 18-under-par, one stroke ahead of fellow American Patrick Rodgers, who bogeyed the par-five 17th. “I think that’s the true meaning behind what I try and do,” said DeChambeau. DeChambeau, 23, is known for his revolutionary approach to the game. He plays with all of his irons the same length, which he believes is a mechanically superior approach. “I have my unique approach to this game,” said DeChambeau. DeChambeau played the front nine in even par, then birdied six of the final nine holes to move to the top of the leaderboard. DeChambeau became the 10th first-time winner on the PGA Tour this season. 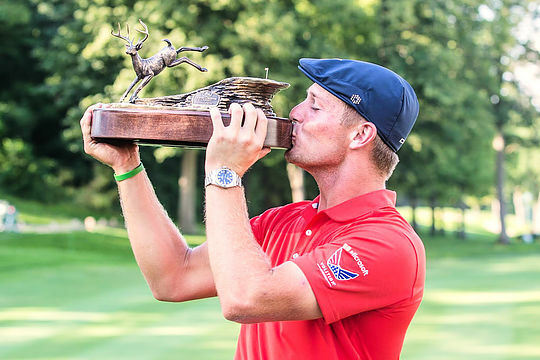 DeChambeau becomes the 21st golfer to make the John Deere Classic his first win on Tour. Rodgers, on the other hand, had four bogeys and his approach into the final hole sailed past the green. Rodgers nearly chipped in from 40 metres to force a playoff, narrowly missing the cup. Cameron Percy was the best of the Aussies securing a top-15 finish with a 13-par-total to secure a share of 12th position. Greg Chalmers and Stuart Appleby also managed a top-25 finish. Curtis Luck missed the 2-under cut mark by a stroke, with Geoff Ogilvy, Matt Jones, Brett Drewitt also missing the cut. Steven Bowditch fired rounds of 75-76, to miss yet another weekend in what has been a dismal season.